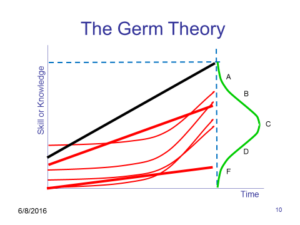 The big problem with about the Germ Theory is that the bottom half or two-thirds of the learners do not have sufficient mastery of the course to succeed in the next course in this subject. Many, despite trying, quickly fall behind, feel incompetent and embarrassed, and increasingly dislike the subject and the teacher. All of these factors combine to diminish motivation for learning the subject. As a consequence, many learners decide that the subject, and maybe school in general, is not for them. Flipped learning is a practical alternative and can produce dramatically better results than the Germ Theory. Learners move at different rates. Each one may be at a different point in the course. That’s why the instruction has to be done primarily through books and videos rather than live lectures. The benefits of studying in class rather than at home include getting help from the instructor or peers as needed, and perhaps fewer distractions. The instructor, to the extent possible, coaches and helps students individually, upon request or as seems appropriate based on observing the students and their individual progress. The instructor also progress checks learners for mastery at selected points in the subject. 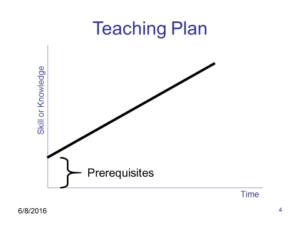 This teaching is usually done in brief conversations lasting1 or 2 minutes. It provides the benefits of one-on-one tutoring without the time and cost of having the tutor waiting while the learner learns by doing. If the instructor has a class of more than about 25 students, the instructor will need graduate teaching assistants and/or volunteer peer-tutors from among the students. If done correctly, the results of flipped learning look like this. The students learn at different rates. However, because the y master each lesson along the way, their learning accelerates. So, on average, the time to actually master a course is reduced by 40%. There is still a distribution of outcomes. But now the differences are in the time to reach competence rather than in the amount learned. At this point, you may have many questions and concerns. In my next post, I will present some that I have encountered with an indication of how I have seen them resolved. 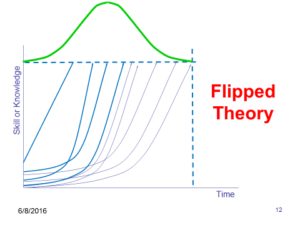 Still, I hope that this article has opened your interest in scrapping the Germ Theory of Teaching for The Flipped Theory of Learning.